Once you type in the current month, windows would want to replace the same word with the current date. You can accept the proposal with [Enter] —or reject it. But this can become annoying at times when you just want to mention the month and not the entire date. This can be changed easily by going to menu command 'Tools | AutoCorrect Options'. 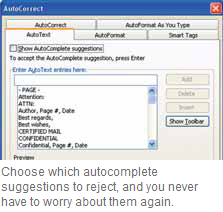 In the opened dialog box click the tab 'AutoText' and disable 'Show AutoComplete suggestions'. Confirm the fi nal action by clicking OK.